Agent Cobb has reported for duty at Northants this week, with the former Leicestershire Foxes batsman passing on vital information to his Steelbacks team-mates. Josh Cobb moved to the County Ground from Leicester during the close season and has been a vital player for David Ripley’s side. He was this week named player of the month after a series of important knocks, with his form in the NatWest T20 Blast crucial to the Steelbacks’ North Group chances. He smashed 48 in the three-run win at Derbyshire Falcons last Sunday, and that effort was preceded by a superb 84 in the defeat at Nottinghamshire Outlaws. This week, however, he can have a big influence off the pitch as well as on it as he looks to use his knowledge of his former county to maximum effect. “It can be a help,” Cobb said. “I know a lot of them pretty well and I’ve fed back information, but at the same time they know a lot about me so that probably evens it out. The Foxes had Cobb’s number at Grace Road last month, getting rid of the dangerous opener for just 13. 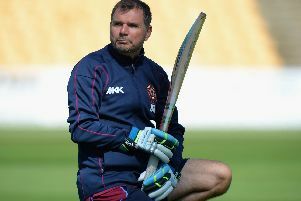 But if he can get going this Sunday, the Steelbacks know they will be in with a big chance of getting another win. Ripley’s men went third thanks to last weekend’s success against the Falcons and are still eager to grab a home quarter-final. And Cobb knows how important the game against a Leicestershire will be. “We were rain affected against them last time so hopefully we can get a full game in, but it depends how their next few results go,” he said. “Again, it’s a big game for us because they’re not a million miles away from us in the league. “We’ve got a game in hand and if we beat them it puts a big gap between us and them going into the last couple of games. Leicestershire host Lancashire Lightning on Friday night before travelling to face the Steelbacks. Northants went a point clear of the Foxes thanks to last weekend’s win against the Falcons, and the North Group remains nip and tuck. “We’ve got a lot to improve on, which is good,” said Cobb. “It’s exciting towards the end of the tournament and we can play a lot better than we did last weekend, so if we do that then we’ll be winning more games. “I think we had three close games leading into last weekend so that’s obviously held us in good stead. Cobb will continue to open in the absence of David Willey, who is out for the remainder of July with an ankle injury. And he said: “I’ve opened for a lot of my career so it’s nice to get back up there and try and set a good platform for the team to win games of cricket.